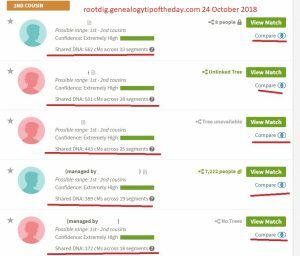 In “Picking Low Hanging Fruit on GedMatch Part I” a potential discovery was made on the parents of Lucinda (Ramsey) Trask who died in Mercer County, Illinois, in 1861. In reviewing what I could find on her probable parents, I was trying to focus on something that would concretely tie her to her family of origin suggested by the pedigree of one of the matches–father Harrison Ramsey and Sarah Kerr/Carr who lived apparently in Clinton County, Illinois, in at least the late 1840s through the early 1850s. 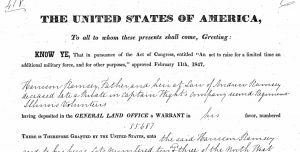 While focusing on online materials is an admittedly limited approach, I did discover a land warrant that was issued to Harrison Ramsey in Clinton County, Illinois, based on the military service of his deceased son, Andrew Ramsey. Harrison indicated that he was the heir of Samuel. I’ve ordered the warrant application and the surrendered warrant to see what it includes. I’ve also got to clarify just what “heir” would have meant at this point in time in terms of the land warrant application process? Who was an heir of a deceased soldier who left no descendants? Was it just a surviving parent or were siblings also included in that designation?